How to describe living the artistic life? How to live a life surrounded by one’s own art? Making art is so intimately linked into one’s sensing of the world that there isn’t simple answers. In the current research of art, we try to map different kinds of knowledge embedded in the artistic processes. ‘Living’ with the arts is like ‘dwelling’, which in fact implies an old meaning for a house. The doors in the house keep opening and closing as a trespass to new fragments of interiors. The repetitious movement of stepping in and out of the interiors gives even the doorhandles almost allegorical significance. Robin Rapoport’s designs at her Conneticut home and studio. Robin Rapoport is a sculptor and designer who has been choreographing for her dance company Headless Horse. As a dancer in Robin’s company, the creative process made me reconsider dancing together with the sculptural. Robin has been looking for a living and forming entity in the sculpture, which could be realized through the dancer’s body and her movements. Another layer came from the Alexander technique, which would bring those two materials even closer together. I asked Robin about this entire connection, wanting to know how the Alexander technique has changed her. RR: So funny you should ask that. The other day I was speaking with a magazine publisher of home design who wanted her editor to meet me and I said I have a class for Alexander Technique, but will skip it in order to meet her. I reflected that most people do one thing like designing, and here I spend so much time on another activity perhaps losing accounts because I’m not as available. But if you understand Mr. Alexander’s work it is crucial to one’s sense of clarity. The more I go, the more I discover holding in my body that I need to release, and as an artist I am curious where this will all lead. I know I’m changing so much already. The way I stand, my breathing, and so I am not so hyper. I can make better decisions with a calmer mind. We are for the most part so disconnected from ourselves and from the proper use of the self, which enters into all arenas of movement. I am very concerned with health and maintaining it. I do not want to stiffen up but remain easy and fluid. And I think to be an artist is to think outside of the box, to think ahead, to be perhaps more aware of the dangers our planet presents to us on a daily basis. This Alexander Technique is what I do to combat that. Robin Rapoport’s sculptures and sculptural furniture display an array of different approaches to organic forms, which could be labeled, as somewhere between Scandinavian and African, they are modern, natural and primitive at the same time.The sculpture and furniture feels animated and living. In some cases it is almost talking to you, and these pieces are shaping the space. The design presence is not too loud, but the pieces make statements and offer alternative points of view to look at the space. A piece of furniture is standing on its own legs, when it is a floor lamp, for instance. 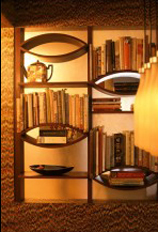 And if it is a bookshelf it can even include eyeballs. You might as well know what I mean: When you talk to plants, you talk to trees. And this design is so ’whimsy’ that you might as well talk to it. When Robin takes on the art of creating a house with her interior design, she likes to enhance the warmth of the interior walls. The walls already have imaginative touch in them. Cardboard covered walls with a touch of asymmetrical designs gives them a hint of geometry, and overall, they have ethereal lightness in them. This meditative approach, which she also calls as an art of ‘dwelling’ continues in the wooden sculptures. The sculptures both gather and form the space around them, and they have their own individualistic character. Robin’s interest to form is fluid. Materials appear with fluidity; they are towards rough or process-like, rather, than simply solid or static structures. The Dance Company is close to being like a living sculpture, where human body is constantly taking new shapes and testing the space where it moves. The dancing bodies with sculptural elements on stage together with them, is another Rapoport’s take on the theme. Along with the abstract, animated and organic forms are these narratives, which have several underlying layers. These stories unfold themselves in a course of a fairytale, or as a series of otherwise magical happenings. Dance, short film, sculpture, and light design evolve from the same source creating narratives without suffocating punctuality. Robin’s events evolve around the form and texture. Sometimes a piece of plexiglass gives an idea to a story that becomes a gesture in the dance performance, or it is part of the furniture created, and the objects found, all made for the home. Home is an evolving space, which is the dwelling. And living one’s home is part of the artistic process. Basically home is living together with art, and art keeps changing, as the interiors get different stories and layers. Robin has created her home in the woods of Greenwich, CT, together with her husband Edward L. Milstein, who himself is a painter of geometric color. Both share a passion for the arts, design and architecture. These three-colliding elements are coexisting in their home, where exterior is also mixing with the interior. 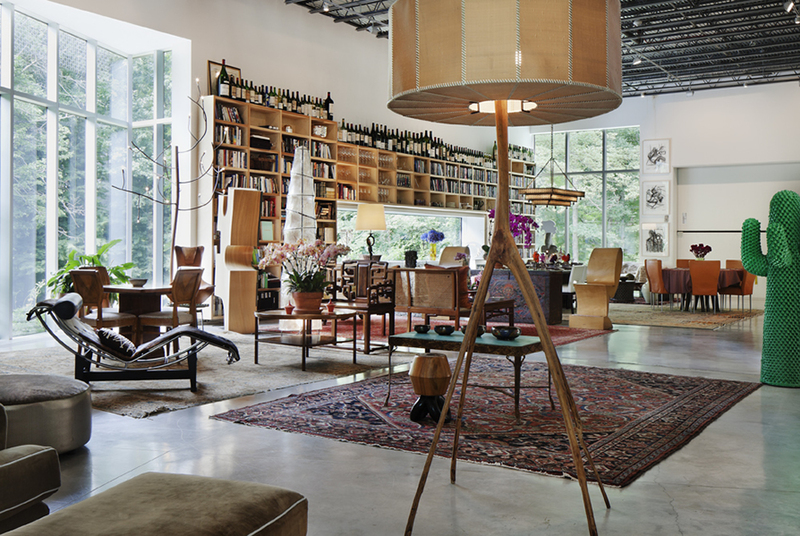 A visitor who comes to their spatial industrial loft-like house and art gallery encounters the presence of the woodland nature. The house is evidently coexisting with its environment, as the landscape is not too worked, but remains the same type of organic fluidity with the rest of the things around. They collaborated with the Robert Young architects to create their ’Art Barn’. In the summer the house has a wire screen wrapped around it which is covered with wisteria, and so becomes a green jewel box in the woods emerging from a winter cinder block form of grey. It is amazing how a ’green screen’ that is like a living skin over most of the surface make the concrete-block look different. The greenery also adds thermal insulation. As of today, Robin has developed Light Designs. She is creating fixtures that come from the sculptural roots of using wood, copper and paper. Interesting ceiling lamps are the ones like an octopus or simply ‘branchy’ wired designs, which are light weighted structures for the ceiling. 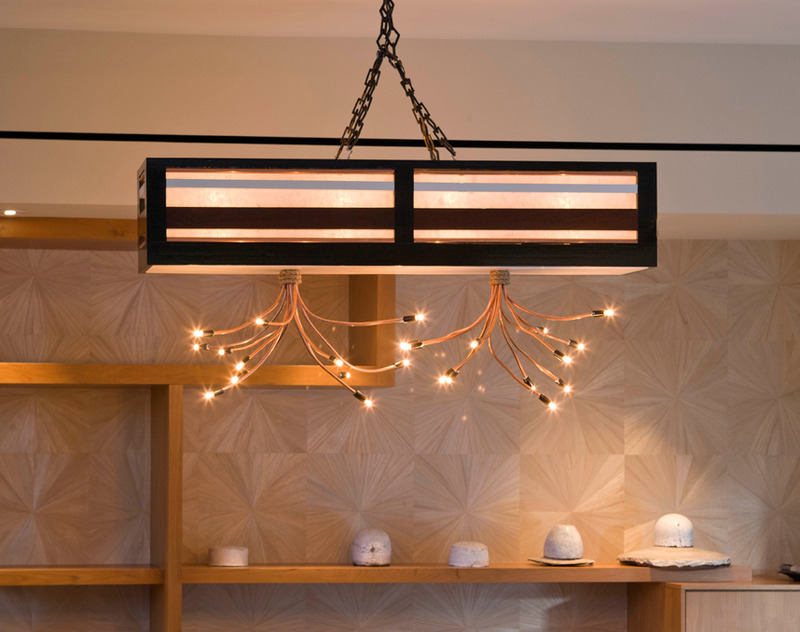 Ceiling lamp can contain one long rectangular design that has two branchy-designs attached to it, or it can be a smaller sculptural design having one wire inside them. I asked Robin few more questions. I wanted to know how living in the woods inspires her. I also asked, where will her designs be in the future, and where will her passion be. RR: I think there is nothing more beautiful and magical and instructive as Nature and so I stay here, somewhat hidden and enclosed and perhaps somewhat lonely at times as well but this is where my work unfolds. When I travel to New York it is to study the Alexander Technique but then I come home to walk the property where I have lived for 24 years. Every year I add or shift plants and every following year I can take pleasure in watching them bloom. Outside and inside are distinct yet connected, as are we with both an exterior and interior persona? With so much suffering and tragedy in the world I feel blessed to have this place as a personal sanctuary and which makes me acknowledge every day a higher being which I can attribute the beauty all around me to. I hope my Light Fixtures can add beauty to a room. They are crafted by hand so each is unique. I am happy to personalize them for customers meaning that I could change the paper color and or wood color. How fascinating is it in Nature that a plant on the outside can be a dull grey with spikes and when it blooms the most delicate of leaves and colors emerge. And this color is for our eyes to appreciate like cinema except you can touch it. My next passion is to have a home furnishing boutique where I would sell my designs for tablecloths and ceramics, as well as have my design services. I love to set the table, and I find very little of interest in the tabletop design right now. So much of what is out there is about simplicity and “whiteness”, but perhaps just too much simplicity. We have lost great craftsmen (women). With the current economy people are afraid to stock inventory that is not trendy. But I am uninspired by what is now trendy. I just find it bland and so will make my own. Robin Rapoport established Headless Horse in 2002 in New York City. The dance company has performed in live show, in festivals and in her short dance films. Her ‘Thief’ appeared in Palm Springs International Film Festival, and in the Jumping Frames Film Festival in Hong Kong.